IT and cybersecurity issues are becoming an inextricable part of the business of many Australian organisations. With the rising strategic importance of IT comes an increasing risk of cyber-attacks. These attacks bring with them the potential for significant reputational and financial damage to affected organisations as well as the possibility of investigation by regulatory bodies. This webinar will appeal to directors with limited knowledge about IT and cybersecurity and will provide an introduction to the landscape, the risks, the choices and how to implement sound governance. 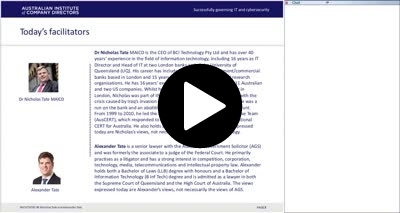 A book companion to this webinar “A Directors Guide to governing information technology and cybersecurity” click here to purchase the book and receive complimentary access to the webinar. Register for three or more webinars of your choice in one transaction, and you can take advantage of our bundle and save promotion. Receive 10% discount for three webinars or register for five or more and receive a 15% discount. *Series webinars are exempt from this offer.